Thank You for your generous donations of $1889 for our Spay and Neuter Fund. We are now at $3389 with the matching $1500. We now need about 6 people to donate $20 each to reach our goal of $3500. We went from 70 to 41 and now 6. Each and every donation is important and We are very Thankful for your kindness. Please free free to cross post this post to your friends. 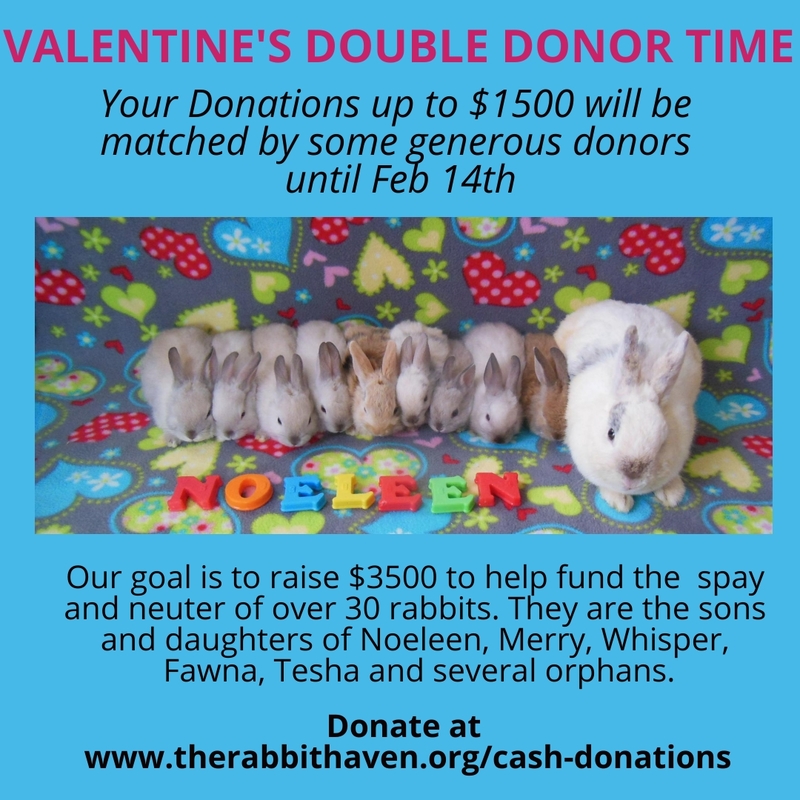 You have raised $1328 for our spay/neuter fund of over 30 rabbits. We have donors who will match your kind donations up to $1500 through Feb 14th. Our goal is $3500. Just a few days ago we needed 70 people to donate $20 to reach our goal. Today we need about 41 people to donate $20 to reach our goal. Donate today and your donation will be matched. The Rabbit Haven has rescued 36 mothers and babies from local shelters since 11-2018. Now, we have to spay and neuter. These are the babies of Noeleen, Merry, Whisper, Fawna, Tesha & Elisha. Plus we have several orphans. That is a very large number of bunnies that also need spay and neuter to be adoption ready. They need your help! We have a match ongoing. You donations up to $1,500 will be matched by generous donors until Valentine’s Day Feb 14th. So every dollar you sent is doubled. Donate today and be the first to help support these sweet moms and babies.